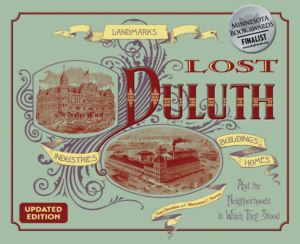 Even before Duluth became a township, speculators had been eyeing the head of the lakes as an ideal spot for a railroad terminus. As early as 1853 Minnesota legislators created a railroad charter for a line to run from Lake Superior to Puget Sound, and in 1864 President Lincoln approved an Act of Congress that essentially created Jay Cooke’s Northern Pacific Railroad (NP) along the planned line. The Lake Superior & Mississippi Railroad reached Duluth in 1871, and by 1926 nine railroads operated out of Duluth: Northern Pacific; Great Northern; Chicago, St. Paul, Minneapolis & Omaha (the Omaha Road); Minneapolis, St. Paul & Sault Ste. Marie (the Soo Line); Duluth, Winnipeg & Pacific; Duluth, South Shore & Atlantic; Duluth, Missabe & Northern; Lake Superior Terminal and Transfer; and the Duluth & Iron Range. Others had come and gone or had been absorbed by other railroads. Their railyards took up considerable space along Duluth’s waterfront, on Rice’s Point, and between downtown Duluth and the wholesaler warehouse district that covered much of today’s Canal Park Business District and the site of the Duluth Entertainment and Convention Center and Bayfront Festival Park. Freight and passenger stations could be found along the tracks from Lester Park to Fond du Lac. While the railway began stretching north from St. Paul in 1863, building from Duluth southward did not begin until 1868. Starting in downtown Duluth, laborers laid track essentially alongside the St. Louis River to Fond du Lac and on to Thomson. It was in Thomson on August 1, 1870, that the final spike was driven, completing the road. Passenger service to Duluth began on August 22 of that year, with Banning eating crow as he hosted guests taking a specially-outfitted train to Duluth. By the end of the year, trains ran between Duluth and St. Paul every day. 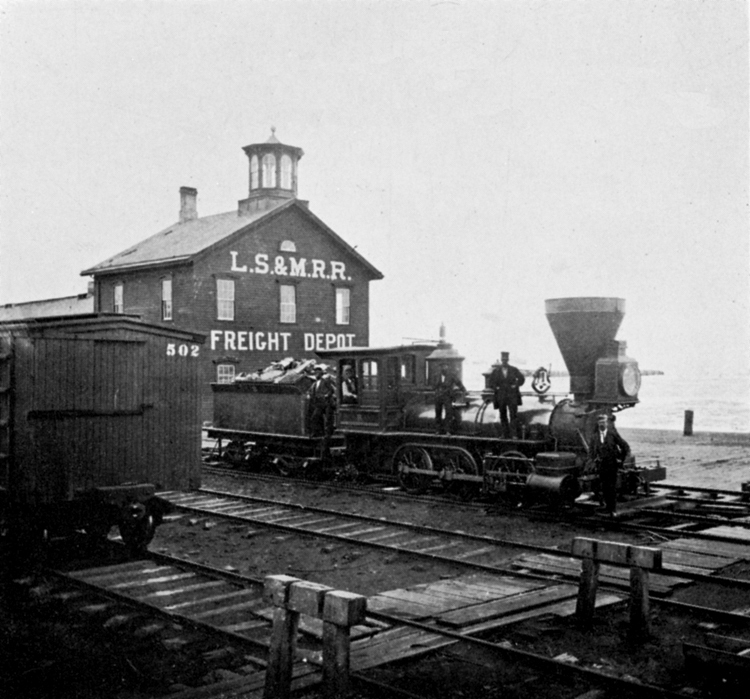 The LS&M constructed Duluth’s first railroad freight depot at 300 East Michigan Street in 1870 next to grain Elevator A and the breakwater that protected it. The next year the LS&M built a five-stall roundhouse on Rice’s Point east of Garfield Avenue. The first Union Depot, a passenger station serving LS&M and NP, went up along Fifth Avenue West behind Michigan Street during this time. The two-story building had just two rooms on the main floor and was likely built in 1870. Cooke’s continued investment in NP stretched his already drained finances, and the great Philadelphia financier went broke in 1873, the same year the NP reached Bismarck, North Dakota. The LS&M managed to hang on without Jay Cooke’s money, even adding ten stalls to its roundhouse in 1876. But the railroad failed the next year, reorganizing as the St. Paul & Duluth Railroad (SP&D). In 1892 a second and much larger Union Depot was built at Fifth Avenue West and Michigan Street to serve six railroads: SP&D, NP, the Duluth South Shore & Atlantic, the Duluth & Iron Range, Wisconsin Central, and Duluth & Winnipeg. Before the century was out, Northern Pacific replaced the 1871 roundhouse with a new roundhouse located west of Garfield Avenue. A massive building, the second roundhouse included stalls for up to thirty-six engines. It was torn down in the 1970s. Northern Pacific also either built or purchased existing buildings for use as depots, including freight stations at 114 South Fifth Avenue West, and at Hudson Boulevard and Commonwealth Avenue. Passenger stations stood at 220 South Twentieth Avenue West and 5400 West Wadena Street.